Interior Secretary Ryan Zinke has taken aim at iconic animals like the bald eagle and the elephant with his policies and pressured subordinates at Glacier National Park in Montana to reopen the park’s lakes to motorized boats after invasive zebra mussels were found in the state. Zinke, who grew up in Whitefish, Mont., likes to talk about how hunters and people who fish help conservation. On Zinke’s first day in office, he signed an order overturning a ban on using lead ammunition and fishing sinkers on federal wildlife refuges that was meant to help prevent animals from being poisoned by lead left on the ground or in the water. Predators like the bald eagle, our national symbol, are susceptible to lead poisoning from eating animals remains left behind by hunters. Lead poisoning in condors, the largest flying land birds in the Western Hemisphere, led to lead ammunition being banned in some California counties and voluntary no-lead programs in parts of Arizona and Utah. The Fish and Wildlife Service banned using lead to hunt water birds in 1991. But environmentalists were unsuccessful in getting an overall lead ban for other animals until Dan Ashe, the outgoing Fish and Wildlife Service director, implemented one. “Overturning the lead ammunition ban may win political points with a few special interests, but it could cost the lives of millions of birds and the health of families that rely on game to feed their families,” said Athan Manuel of the Sierra Club. 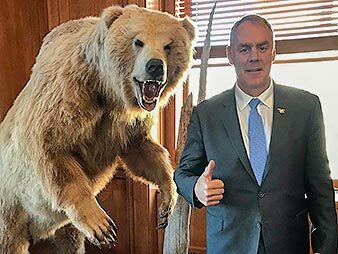 Zinke put a grizzly bear and a stuffed bobcat in his office. One of Zinke’s backers in getting the job was Donald Trump Jr., an avid hunter who was photographed in 2012 holding the bloody tail of a dead elephant. In November, the Fish and Wildlife Service lifted a 2014 ban on importing the body parts of dead elephants from Zimbabwe and Zambia. Trump put the imports on hold after widespread outrage, but recently the FWS said it would grant permits on a case-by-case basis. Safari Club International is another former Zinke campaign contributor. “It would seem that Zinke is letting Safari Club set Interior’s agenda,” said Tanya Sanerib of the Center for Biological Diversity. In Montana, the National Park Service closed all park waters to boats in November 2016 after the larvae of zebra mussels were found in two state reservoirs, the first time the invasive mussels had been found in Montana. Water from the park drains into three continental scale watersheds, the Columbia, Missouri and South Saskatchewan basins. But last summer park officials, under pressure from Zinke, allowed motorized watercraft in the park’s pristine lakes. Zinke is carrying water for hunting and fishing interests even when it threatens to befoul his home state. Contact Secretary Ryan Zinke and tell him that you want our nation’s Interior Department to protect animals, not endanger them. Call him at 202-208-3100, reach out to him on Facebook, Twitter or send an email. The Center for Biological Diversity can be reached at 520-623-9797 or at center@biologicaldiversity.org.